Villány (German: Wieland) gained town privileges in 2000. It is located 36km south-southeast of Pécs and is known as the capital of red wines in the south of Hungary. This historical southernmost Hungarian vineyard lies on the hills and plateaus of the south Villány Mountains. The wine area covers 2.200 hectares. In the western part, the Siklós area, predominantly white wines are grown, red wines on the eastern side. 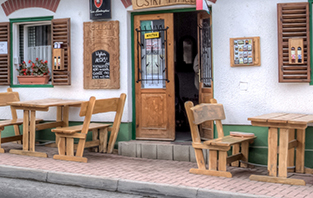 The first Hungarian “wine route association” was founded here in 1994. To the southwest of the town, the “second Mohács battle” took place on August 12th 1687 in which the army of Bavarian elector Max Emanuel was attacked by the Ottoman troops. The attack was warded off with the help of Imperial regiments and a counterattack on the Ottomans brought a victory for the Christian side. Generals like Karl Count of Lorraine, Ludwig Margrave of Baden and Prince Eugene of Savoy were involved in the triumphal defeat. The battle was a milestone of the Ottoman Wars in the late 17th century and is even nowadays reflected in the names and labels of some wines. Such as in the name “vale of tears” or “vale of tears selection” which refers to the vineyard by the same name which is located on a previous battlefield. As legend has it, the wounded Ottoman soldier shed tears and lamented for days since the Christian soldiers were only taking care of their own wounded comrades. Some winegrowers also call their wines after Imperial generals. Thus, there is a rosé “Styrum” which was selected as the best rosé of southern Hungary in 2013. The village belonged to the Bellye property, which was founded in 1699 and belonged to the prince Eugene of Savoy. After his death, the property went to the Habsburg family. A conscription list from 1715 records 49 “raitzisch” (local word for Serbian) families in Villány. The settlement of Germans commenced after 1730 and lasted until the late 18th century. The local red wines and the wine cellar alley, which is listed as a protected monument, made the village famous in the whole of the country. The wine cellar district is located on a hill southwest of the town centre. 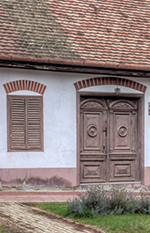 As typical for villages of Germans of Hungary, the winegrowers did not build their wine cellars on their property, but on the edge of the village. Otherwise, they would have had to sacrifice a portion of their vineyard for it. Also, the location brought the cellars closer to the homes, since most vineyards were outside the village. Thereby, districts with a specific function emerged: after the grape harvest, the wine was processed and stored there. At the moment, approximately 200 families make a living from viticulture. 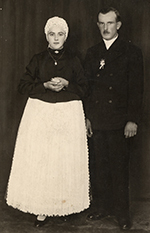 LEFT: German bride and groom, Villány approx. 1930. RIGHT: Well preserved wine cellar. At the moment, approx. 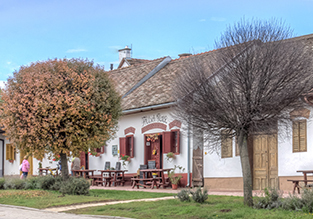 200 families in Villány make a living fom viticulture. 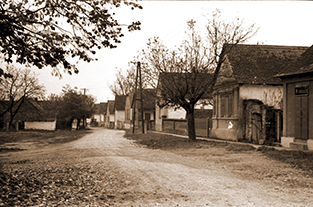 Village street of Villány, 1975.